Tim Berners-Lee used to say: "I just had to take the hypertext idea and connect it to the TCP and DNS ideas and—ta-da!—the World Wide Web." So how this "simple" invention happened? 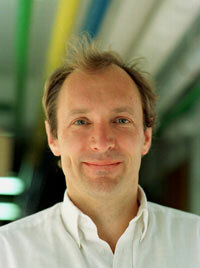 In March, 1989, a physicist and a computer nerd in CERN (European Particle Physics Laboratory in Geneva, Switzerland), Timothy John "Tim" Berners-Lee (born 8 June 1955 in London), submitted to his boss a proposal for an information management system, the prototype of the now ubiquitous World Wide Web. The boss was not very impressed. Vague, but exciting, were the words that he wrote on the proposal, thus unofficially allowing Berners-Lee to continue his work on WWW (actually the term World Wide Web will be decided next year, in 1989 Berners-Lee called his system Mesh). 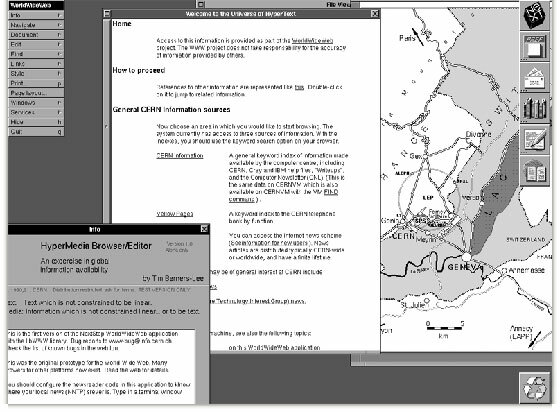 Berners-Lee had already an experience with hypertext systems, including his own. During his first stay in CERN, in 1980, inspired by the MEMEX of Vannevar Bush, Project Xanadu of Ted Nelson and NLS of Douglas Engelbart, he proposed a project for a new document system, based on the concept of hypertext, designed to facilitate sharing and updating information among researchers. The system was called ENQUIRE and was written in the Pascal programming language, using NORD-10 (16-bit minicomputer of Norsk Data, running under operating system SINTRAN III), later the program was ported to PC, then VMS (see the original proposal for ENQUIRE). The inspiration of Berners-Lee came from the frustrating fact, that there was a lot of different data on different computers, but it was not connected at all. Because people at CERN came from universities all over the world, they brought with them all types of computers. Not just Unix, Mac and PC: there were all kinds of big mainframe computers and medium sized computers running all sorts of software. One had to log on to different computers to get at it, and even sometimes one had to learn a different program on each computer. So finding out how things worked was a really difficult task. Berners-Lee wanted to wrote some programs to take information from one system and convert it, so it could be inserted into another system. More than once. The big question was: "Can't we convert every information system so that it looks like part of some imaginary information system which everyone can read?" And that became the WWW. In 1990, with the help of his colleague from CERN—Robert Cailliau, Berners-Lee produced a revision of the system, which was accepted by his manager. 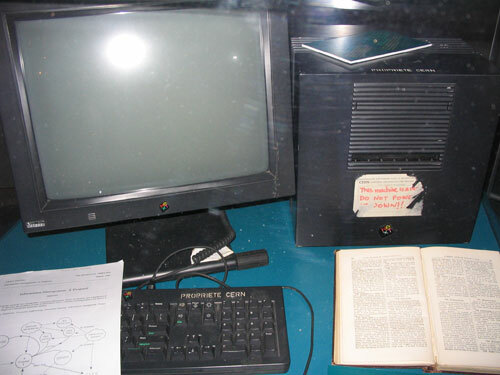 Berners-Lee coded the first Web browser, which also functioned as an editor (the name of the program was WorldWideWeb, running on the NeXTSTEP operating system), and the first Web server, CERN HTTPd (short for HyperText Transfer Protocol daemon), both running on a NeXTcube workstation (see the images bellow). The first Web site in the world (with the DNS name info.cern.ch) built was put online on 6 August 1991. In 1990s WWW gradually became the prevalent technology in Internet an a global information medium. Today, the Web and the Internet allow connectivity from literally everywhere on earth—even ships at sea and in outer space. In 2011 the number of web-sites exceeded 300 million. As of April, 2012, the Indexed Web contains at least 8.02 billion pages. In the beginning of the century, new ideas for sharing and exchanging content ad hoc, such as Weblogs and RSS, rapidly gained acceptance on the Web. This new model for information exchange (called Web 2.0), primarily featuring DIY (Do It Yourself—is a term used to describe building, modifying, or repairing of something without the aid of experts or professionals) user-edited and generated websites and various other content like video and audio media (YouTube), microblogging (Twitter), etc. Today, the internet is even used to purchase luxury items online like a Viking Yacht For Sale. What is the future of WWW? How will the next version—Web 3.0 look like? The vision of Tim Berners-Lee's vision of the future Web as a universal medium for data, information, and knowledge exchange is connected with the term Semantic Web. In 1999 he wrote: "I have a dream for the Web in which computers become capable of analyzing all the data on the Web—the content, links, and transactions between people and computers. A Semantic Web, which should make this possible, has yet to emerge, but when it does, the day-to-day mechanisms of trade, bureaucracy and our daily lives will be handled by machines talking to machines. The intelligent agents people have touted for ages will finally materialize. And later in 2006 he add: "People keep asking what Web 3.0 is. I think maybe when you've got an overlay of scalable vector graphics—everything rippling and folding and looking misty—on Web 2.0 and access to a semantic Web integrated across a huge space of data, you'll have access to an unbelievable data resource."